Anyone who’s ever driven through Ohio has probably noticed the vast farms and cornfields that flank our major highways. In fact, the state contains more than 13million acres of farmland. Funny farm related story: a parent of a close college friend thought I actually grew up on a pumpkin farm – those of you who know me will probably find that pretty hysterical. I actually live in the greater Cleveland area, not on a farm, but I can reap the benefits of living amongst all this wonderful farmland. Saturday morning I let the two markets I visited dictate my “local” meal. I ended up with eggs, butter, bacon, and grits (not to mention a crepe, a sourdough loaf, coffee… I love a good farmers market)– put ‘em all together – cheesy bacon grits with poached eggs on top. Sounded like a winner to me. Bring the water to a boil in a large pot. Slowly pour in the grits, stirring constantly. Reduce the head to low and continue to stir. After about 10 minutes, the grits will plump up and thicken. 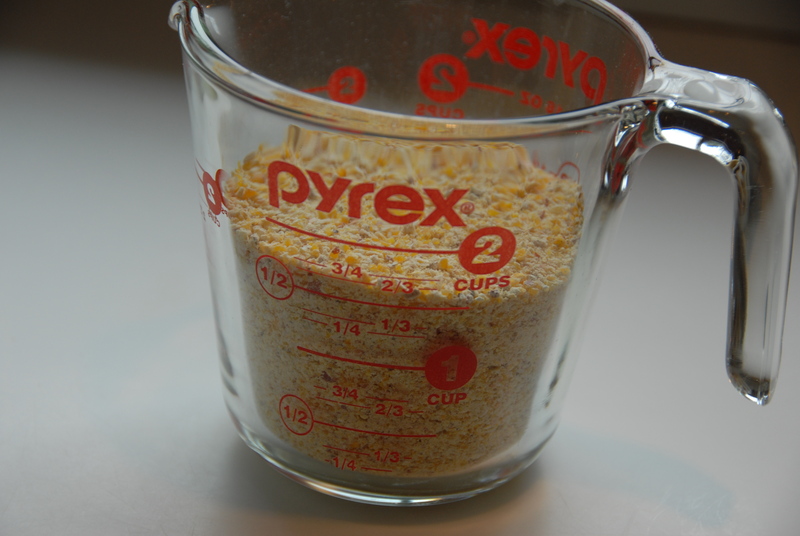 Cook the grits over low heat for another 25 to 30 minutes, stirring frequently. Add the cream, butter, cheese. Cook for another 10 minutes to allow the cheese to melt. 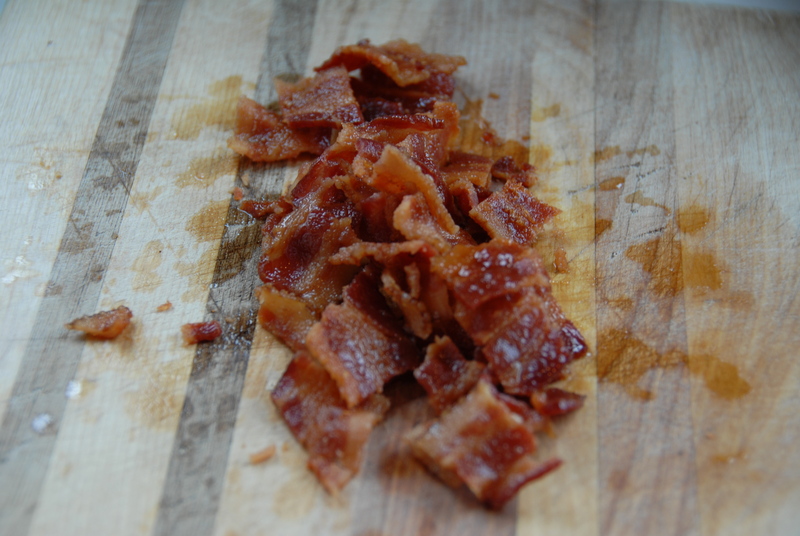 Season with s&p and add the bacon. 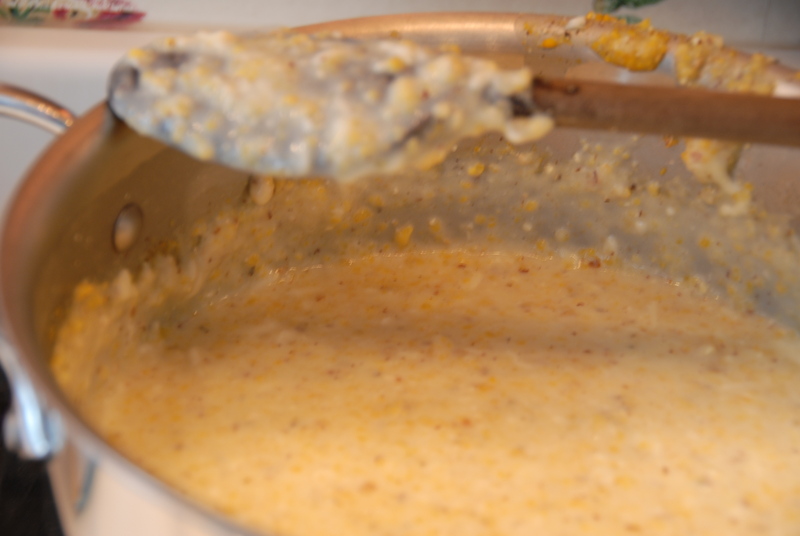 The grits will have a thick natural creamy consistency. They could be a meal by themselves, you almost don’t need the egg but then, why not have the egg? Once you’ve become a master poacher – top the creamy, cheesy grits with said eggs and dive in. 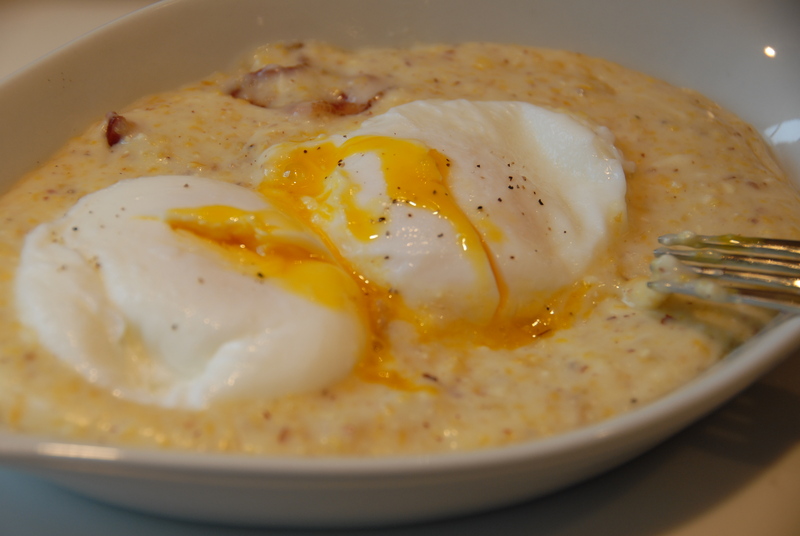 The velvety yolk marries with the bacon dotted grits to make a perfect bite. Good job Ohio, if this is eating local, count me in. This entry was posted in Bacon, Butter, Eggs, Local Food, Pork and tagged bacon, butter, cheesy, cream, grits, local, Ohio, poached egg. Bookmark the permalink. Can’t stop laughing about the pumpkin farm… And that looks SO DELICIOUS!!!! You need to send me some of those stone ground grits STAT.